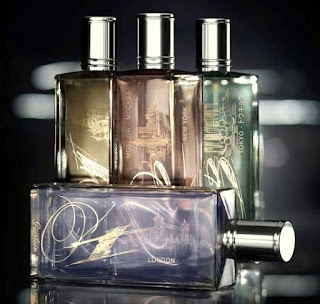 In May 2009, Guerlain presented the Les Voyages Olfactifs fragrance collection inspired by the cities of Paris, New York and Tokyo. Two other scents were launched: London in 2011, and Shanghai in 2012. Created by Thierry Wasser as an olfactive journey to the heart and soul of the world capitals, using the finest of fragrance materials and unique flacons designed by Serge Mansau. Each cylindrical clear glass bottle is inscribed with its fragrance name and topped by a silvery top. Holding 250ml of eau de parfum, each bottle is like a fragrant postcard of the city it represents. For the 2011 launch of London, the fragrance was presented in a 100ml, rectangular, clear glass, air travel-friendly bottle. To enhance the bottle, Serge Mansau drew a sketch, which was then engraved in platinum that traces out the emblematic spot of the city. In this case, the Tower Bridge, a symbol which illustrates the spirit of London. The other three previous editions were also presented in 100ml bottles, each decorated with a symbol evocative of their location and notoriety. The collection was discontinued in 2014. Les Voyages Olfactifs 01 Paris-Moscou: It is classified as a floral woody musk fragrance for women. Les Voyages Olfactifs 02 Paris-New York: It is classified as a woody oriental fragrance for women. Les Voyages Olfactifs 03 Paris-Tokyo: It is classified as a green oriental fragrance for women. Les Voyages Olfactifs 04 Paris-London: It is classified as a fruity floral gourmand fragrance for women. Les Voyages Olfactifs 05 Paris-Shanghai: It is classified as a floral woody musk fragrance for women.